Part two of a two-part blog series. Head here to read part one. Cities provide numerous economic benefits and challenges; some of which include: entrepreneurialism, education opportunities, traffic congestion, pollution, and poverty to name a few. Perhaps the biggest challenge as a result of this trend will be a spike in food, water and commodity prices, which are already high. Some Governments, scientists and environmentalists are already working on solutions to these problems (such as China’s plan for a massive new desalination plant), but in many areas resources are limited and solutions are inefficient on a large scale. Finally, the trend of wealth inequality in the United States is approaching an all-time high. 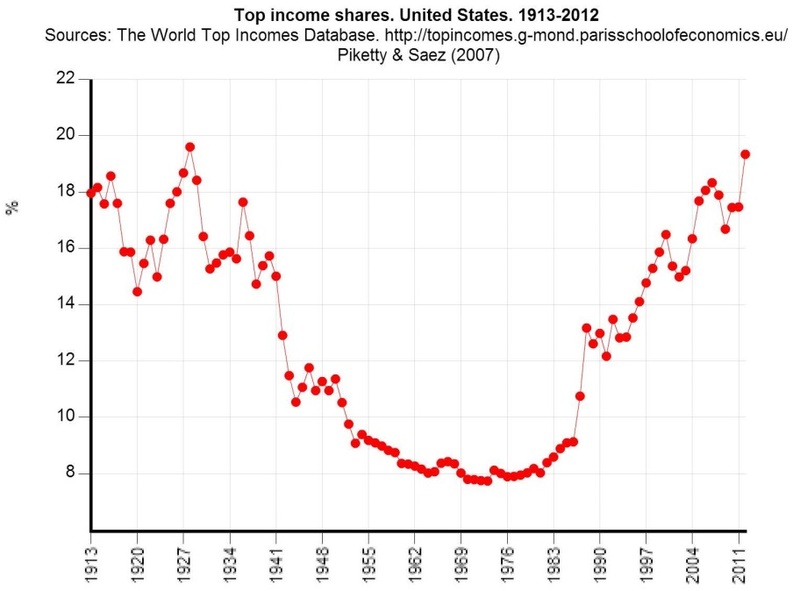 For perspective, in 1928 the top 1% of the population earned nearly 20% of all income. The wealth gap was at its lowest in the 1960s and 1970s, but has been steadily widening since then. This trend has been made public in the U.S. as demonstrated by the Occupy Wall Street movement in 2012. Regardless of your opinion surrounding the subject, wealth inequality has created noticeable economic challenges. Some of the nationwide problems associated with wealth inequality include deteriorating health, the potential for corruption (in many different facets), and a relatively weaker middle class which has historically fueled the most economic growth in the U.S. The income gap has been blamed on everything from computers, to immigration, to global competition, but simply stated there is no clear consensus regarding the cause. This needs to be kept in mind by investors, economists and especially politicians before we spend public dollars on initiatives that aren’t effective at reducing the problems previously mentioned. These changing demographic trends will no doubt provide challenges, but can also present exciting opportunities for generations to come if they are properly prepared for. The United nations Population Fund. http://www.unfpa.org/pds/urbanization.htm May, 2007. Population Reference Bureau, 2012 World Population Data Sheet, 2012. New York Times Online. http://www.nytimes.com/2006/08/22/world/22water.html?_r=0 Celia Dugger. August 22, 2006. China Daily. http://usa.chinadaily.com.cn/china/2011-04/09/content_12298084.htm Cheng Yingqi. September 4, 2011. American Medical Association. http://www.who.int/social_determinants/publications/health_in_an_unequal_world_marmott_lancet.pdf Michael Marmot. December 9, 2006. Brinker Capital provides this communication as a matter of general information. Portfolio managers at Brinker Capital make investment decisions in accordance with specific client guidelines and restrictions. As a result, client accounts may differ in strategy and composition from the information presented herein. Any facts and statistics quoted are from sources believed to be reliable, but they may be incomplete or condensed and we do not guarantee their accuracy. This communication is not an offer or solicitation to purchase or sell any security, and it is not a research report. Individuals should consult with a qualified financial professional before making any investment decisions.